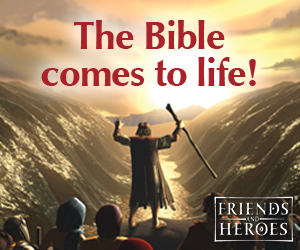 Instant Download KJV Bible Lesson - $2.95 - 13 Pages - Includes everything on this page. Print Bible verse card onto card stock and make copies. Printable pattern available to members and as an instant download, above. Children learn that we don't have to be afraid because God is watching over us. He protects and and comforts us when we are afraid. Print out the picture and make copies. In class have your children color the picture and then write the Bible verse on the lines at the top of the picture. Printable pattern available to members and as an instant download, above. 1. Before class print out the sheep pictures onto card stock, and cut them apart. Punch a hole in each one and thread some yarn through the holes. 2. Roll up newspapers to make staffs. Place a piece of brown paper, the same size as a newspaper on the table in front of you. On top of the brown paper, place three sheets of newspapers. Roll all three pieces together starting at one corner and rolling to the opposite corner. Tape it closed in the middle. You should only have to use one piece of tape around the middle for the whole thing. 3. Tuck in the top and bottom points. You can secure them with a hot melt glue gun. 4. In class have your children decorate their rods anyway they want. They may want to use markers or crayons, stickers, paint, or roll tape around them to make candy cane stripes. 5. Tie and tape the pictures onto the tops of the shepherd's rod when the children are done decorating them. As the children work explain to them how important a rod was to a shepherd. 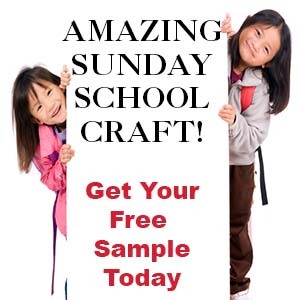 In Bible times when a child was old enough to tend his father's sheep, he would be so excited to go out and look for a sapling that would be perfect to make his first rod. The sapling would be dug from the ground and then whittled down to just the right length and width to fit the child's hand. The young boy would spend hours practicing with his club, learning how to throw it fast and accurate. This was very important because the staff was the shepherd's main weapon against wild animals to protect himself and his sheep. Use this printable as a coloring sheet to review the Bible lesson or as a poster to illustrate your lesson, or for a bulletin board display. The poster comes in both color and black and white. 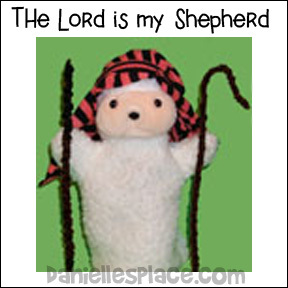 Preparation: Dress your sheep puppet in a shepherd's head covering and make a small staff and rod out of brown pipe cleaners and secure it to its hands. Teacher: I have invited our special guest back today. Woolie, where are you? Teacher: Woolie what are you wearing on your head? Is that a shepherd's head covering? Are you pretending to be a good shepherd? Teacher: What do you have in your hands? Is that a shepherd's staff and a rod? Teacher: You look like a good shepherd Woolie. All good shepherds carry a staff and rod. Does your shepherd carry a staff and rod? Teacher: The sheep don't have to be afraid because they know that the shepherd will protect them with his rod. The good shepherd protects the sheep from snakes, bears, coyotes, wolves, cougars or stray dogs. They also know they don't have to be afraid because the good shepherd comforts them and rescues them if they are in trouble. If a sheep gets stuck up on a ledge or in some briars, the shepherd will use his staff to pull them out of danger. We have been studying the 23rd Psalm. Does anyone remember where we find the 23rd Psalm in the Bible? (Open your Bible, or let a child try to find it, and read the fourth verse.) This verse means that when we are afraid, God will comfort us. We can know that God is with us and protecting us just like a shepherd protects and comforts his sheep. Woolie, thank you for showing us your rod and staff. I hope you have fun pretending to be a shepherd. Can you come back next week and tell us more about the good shepherd? 1. Place snakes, bears, coyotes, cougars, or any other type of stuffed animal you can find in two rows on the floor in your room. Use blue material for fast moving water, fake plants for briars, etc. 2. Mark out two paths zigzagging through each row of stuffed animals using masking tape. 3. Mark off starting lines for each row of animals. 4. 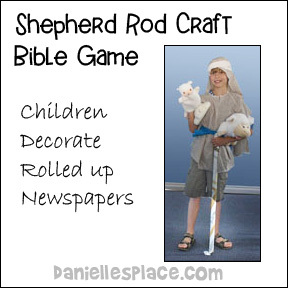 Make shepherd rods out of rolled up newspapers (See opening activities). 5. Make balloon sheep. Draw sheep faces and tails on white balloons. In class divide your children into two teams. Place them at the starting lines. Give the first player of each team a balloon sheep. 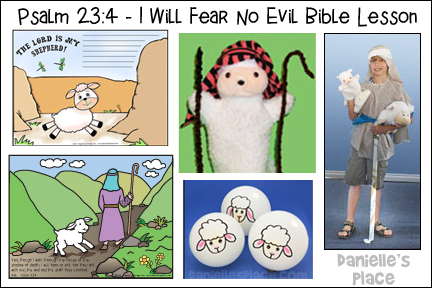 Tell them that a good shepherd uses his staff to protect his sheep from wild animals, (Point out each animal on the floor) and other objects such as cliffs, fast moving water and briars. 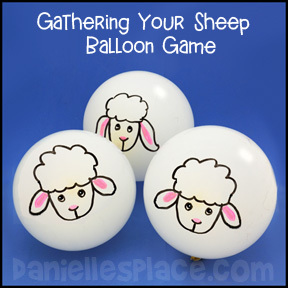 Tell the children that they are to guide their sheep (balloons) along the paths and back without letting them touch any of the objects on the floor. If their sheep touches an object, they have to go back to the start line and start all over. The first team to have all their shepherds guide the sheep through the path first wins. *If you have children that are kindergarten or younger, just have them hit the balloon around the animals and back. Don't worry about if they touch the animals. Buy biscuit dough or bread dough before class. Give each child a section and show them how to roll it into a long roll and then bend down one end to make a shepherd's staff. Bake them and enjoy. If you don't want to bake in class, you can use a no bake peanut butter recipe dough to make them, but make sure you don't have any children that are allergic to peanut butter in your class. Place all the ingredients in a bowl and mix them together until they are smooth. 1. Print out the cube pattern, cut it out and glue or tape it together. 2. In class have your children sit in a circle. Each child takes a turn throwing the cube. 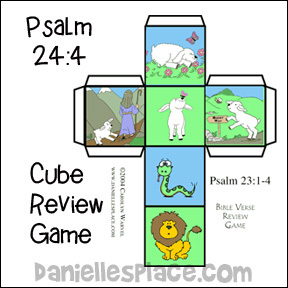 If the cube lands on a Bible verse picture, the child should say the appropriate verse. You can also give a small snack reward. 3. If the picture of the shepherd holding the staff is facing up, the child says the verse and becomes the "shepherd". He gets to hold the shepherd's staff. (Use the pipe cleaner staff that you made for the Woolie puppet.) He is the shepherd until another child rolls the die and gets the shepherd picture or until he fails to tag a child who rolled a wild animal picture. 4. If a child rolls a picture of a lion or snake, he gets up and runs around the outside of the circle back to his space trying not to get tagged by the shepherd. 5. If the child gets tagged by the shepherd, he goes back to his space. If he doesn't get tagged, he becomes the new shepherd until someone rolls the shepherd picture again. Sing to the tune of "Do Lord"
Thou art with me all the way. I did this lesson for a group of children ranging from three years to nine years (our Sunday School is small). We had a blast. I made a handmade sheep and shepherd puppet. I made a dialog between Woolie and his shepherd. Here's how the mini skit went: Woolie is a scared little sheep. Everything around her scares her until her shepherd has a nice long talk and shows her what his staff can do. Woolie is not convinced until one day, she is stuck in a bush. Her shepherd comes and uses his staff to help her get free; and Woolie is not a scared little sheep anymore.